The type of places I write about on this blog has really changed. If I look back the posts of 4 years ago they were about my trips to Europe and Switzerland and our honeymoon through the Eastern Cape. Now most of the posts are about the places I visit with my 3-year old son. 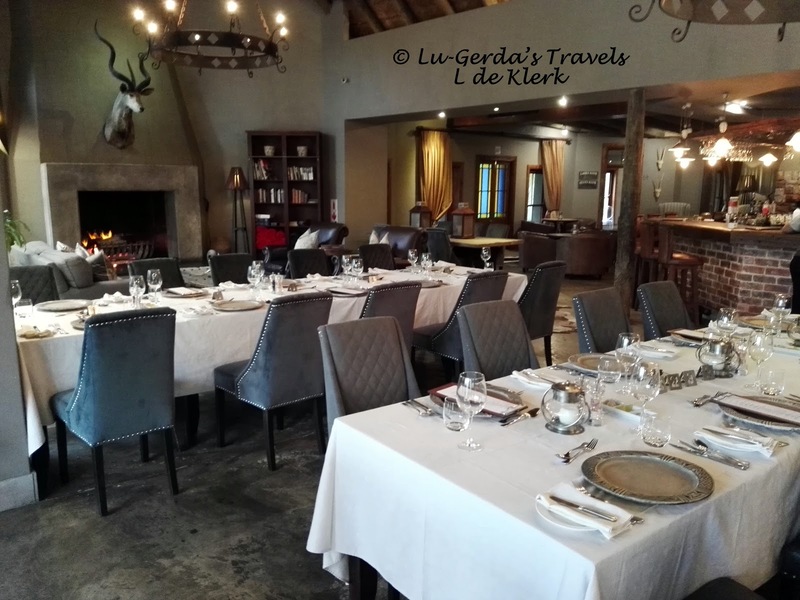 But today I am writing about a grown-up outing to Botlierskop Private Game Reserve. My husband and I were treated to a night at Botlierskop in January for a friend’s 40th birthday. Botlierskop Private Game Reserve is a Little Brak River, about 22 kilometres from our home. Just outside of Little Brak we turned off of the tar road onto a gravel road. This road was not in a good condition but we soon arrived at the entrance. Once inside we met our guide or host for the 2 days. He gave us a quick tour of the Main Lodge and we completed all the paper work. Then another guide took us to our tent with a golf cart. We stayed in one of the Luxury tents close to the Moordkuil River. This was definitely not the kind of accommodation we were used too. When they say “Luxury” they mean it. The tent had a 4 poster bed with mosquito nets, air-con, electric blanket, telephone, safe, coffee and tea making facilities and minibar. The en-suite bathroom has a deep oval bath and a outdoor shower with lots of amenities. The tents are built on wooden deck and ours had a nice view of the river and bush. After settling in and relaxing for a while we walked on the wooden walk-way to the Main Lodge where we were meeting our friends for dinner at the Fireplace Restaurant. Our friends were not there yet (due to fog the plane could not land and they were redirected to Cape Town and had to drive from there) and we bought some drinks and relaxed in one of the lounge areas. Then it was time for dinner. It was lovely. We started with amazing butternut soup followed by a choice of two starters. I had the bacon and cheese tart. The main course is served as a buffet. The salads and vegetables were placed on the counters and you help yourself. Then order your meat at the grill. There were a lot of options for meat…from beef, different game fillets, pork neck and even crocodile tail. I played it safe and got some beef and pork neck. All the food was lovely. Then to end the meal there was a choice between about 4 desserts. I choose the chocolate malva pudding with ice cream and it was amazing. It was a great meal and afterwards we continued our get-together in one of the lounge areas before getting a golf cart to take us back to our tent. It was windy outside but our tent was nice and cosy. It took a while to get use to the sound of the wind but soon we were asleep. Some of the guests in our group decided on an early start to ride the horses. We don’t get many chances to get up late (Our son is usually awake before 6am) and decided against this excursion. Arriving at the main lodge to early we, settled on the deck with coffee while waiting for the rest of our group. Breakfast was once again great. There were lots to choose from…from fruit salad and yogurt, different breads with cold meats and spread and the warm breakfast. For the warm breakfast we went to the grill and could order the type of eggs you want and what you want with it. I had a very nice omelette with bacon and cheese and some other sides. There were lots of different juices and wonderful coffee to drink. And my favourite thing was the croissants…delicious. By the time we finished our breakfast it was time to check out. And of course after all the paperwork was done and we reached the car I realised my purse was missing. So all the way back I went to get go get my purse in the tent. It was a wonderful break. Even though we were only 20 kilometres from home it felt like we were far away.